Hose Length Approx. 180cm/ 70.87 "
Shower Nozzle Size Approx. 19x6.5x3.5/ 7.48x2.56x1.38 "
Pump Size Approx. 13x8x6cm/ 5.12x3.14x2.36 "
- Built-in water-resistant on/off switch, suction cup and hanging hook included. - Easily assembled with included instruction, compact size and light weight designed for easy holding. - Compact and portable, easy to carry with you when traveling. - Enjoy all the amenities of home without the need for plumbing. - Provides up to 60 minutes of use on a single 2- to 5-hour charge. - Powered from built-in battery or USB charging (USB cord included). - Hands-free hanging with S-shaped hanging hook and flexible hose. - High water pressure with only 1 level of flow rate standing at 2.5L/min. - Suitable for domestic shower or outdoor shower under condition of no running water. 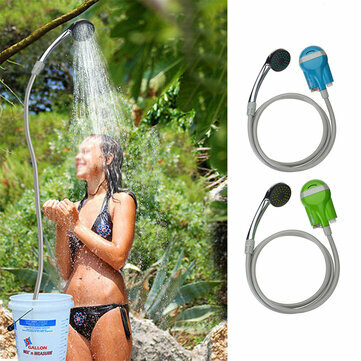 - Indoor or outdoor handheld shower, converting into a gentle, steady, shower like stream. - Offers ideal pressure that’s comfortable for infants, the elderly, small pets and delicate plants.